Road Ahead 2019- What can charities expect from the year a head? 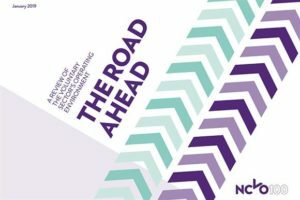 National Council of Voluntary Organisation has published the Road Ahead 2019, which reviews the operating environment for charities every year and examines the challenges they are likely to face. Results of Civil Society Futures, published last week, which examines how English civil society can flourish in a fast-changing world. Through community events, academic research and online debate, Civil Society Futures create a space for a much-needed conversation among those involved in all forms of civic action – from informal networks to vast charities, Facebook groups to faith groups. If we don’t connect closely enough and deeply enough with people who matter, we will lose touch and fail to deliver the change we seek. Sample drawn from a larger birth register of twins born in England and Wales in 1994-1995. The study sample represents full range of socioeconomic conditions in Britain. a) How often do you feel that you lack companionship? b) How often do you feel left out? c) How often do you feel isolated from other? d) How often do you feel alone? The scale was administered as part of computer-based self-complete questionnaires. • 23-31% of participants reported experiencing loneliness ‘some of the time’, and 5-7% reported feeling them ‘often’. These rates indicate that feeling of loneliness in the general population of young adults are not uncommon but there frequency is high. • Loneliness did not differ across genders. • Loneliness was most strangely associated with depression and anxiety, the odds are doubled. • Lonelier individuals were also more likely to have sought help for mental health problems from a GP, psychiatrist, counselor or psychotherapist in the past year. • Loneliness associated with risk behavior that predicts future ill health: lonelier individuals engage in less day to day physical activity and were more likely to be daily smokers, lower overall life satisfaction, report problematic use of technology and use more negative strategies to cope with stress. • Lonelier 18 years old were more likely to be out of work and education, and to have lower educational qualifications, therefore, loneliness could be a force for downward social mobility. • Lonelier individuals rate themselves lower in terms of term working but not their practical skills like IT. • Lonelier individuals also report overall lower optimism about their ability to succeed in life. • Loneliness is not associated with aspects of the early family environment therefore, lonelier can occurs in children of all socioeconomic background. • However, children who had higher levels of neuroticism, depression and anxiety or who have experienced bullying or social isolation in childhood were lonelier at age 18. • Loneliness is an important determinant of long-term health and functioning. Although loneliness is associated with older population this study demonstrates that loneliness is also a common experience in young people, occurring indiscriminately across gender and socioeconomic strata. • The finding also shows that loneliness is a marker of poor functioning across many different domains of well-being and health. Lonelier young adults in this study reported using technology compulsively, at the expense of other activities and obligations. Excessive use of electronic devices many, in turn, constitutes an additional risk for impaired sleep quality (Carter et al. 2016). Lonelier individuals are characterized by shyness and lower self esteem and these traits may undermine their confidence in their ability to compete in the labour market (Cacioppo et al. 2006). Low income and unemployment may, in turn, contribute to feelings of loneliness (Luhmann & Hawkley, 2016). Early risk factos for loneliness lie with children’s own emotional health and experiences with their peers. The analysis of successful intervention early to reduce loneliness indicates that the most successful strategies involve addressing destructive patterns of social cognition to prevent the emergence of loneliness in young people. Focusing on children who have experience bullying and/ or experience isolation by their peers.